The new year started off so wonderfully with a four-day festival, organised by my Trasimeno Music Festival staff, in the Ca’ Sagredo Hotel on the Grand Canal in Venice. Their gorgeous Music Room was the venue for four concerts in four days–a solo recital to start off with; then an evening of romantic music and poetry on an Italian/Venetian theme with actor Roger Allam and myself; an ensemble from the acclaimed Baroque orchestra “Il Pomo d’oro” and mezzo-soprano Giuseppina Bridelli; and finally a concert with cellist Enrico Bronzi. The whole thing was magical and a huge success, with 130 people coming from all over the world. I have no idea whether I’ll repeat it, but we will remember it for a long time. Then it was off to Berlin to record the second-last of my Beethoven CDs for Hyperion. Very satisfying work. Then to Bochum to play de Falla’s Nights in the Gardens of Spain, and to renew my acquaintance, after far too long, with conductor Hans Graf. On January 24th I performed Book I of Bach’s Well-Tempered Clavier for the first time in ten years. Ninety minutes before that recital I fell down some steps that I simply didn’t see, going into the sacristy of the church in Oxford where the concert was held. Fortunately I was carrying a lot of stuff so didn’t put my arms out when I fell. But I broke my left foot. The pain was terrible, but I played anyway–as I did in London’s Wigmore Hall, two nights later. It took a while to diagnose exactly what was wrong. So now I’m on crutches for several months, and need help everywhere I go. Fortunately I have a wonderful network of friends (largely thanks to my festival in Italy and the marvellous audience that comes there) who are putting themselves out to support me in my travels. Thank you so much to all of you! Only one recital had to be cancelled when the pain was still intense and the diagnosis not yet complete. Last week I made my official debut in Budapest, playing two concertos with Concerto Budapest and conductor Andras Keller. That was great, and I so enjoyed being there and meeting such kind people everywhere. I couldn’t go out much, but it didn’t matter. So you never know. I am always very careful on steps, but those ones I simply didn’t see in time. There should have been a word of warning on the door, surely. 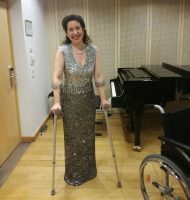 And I was a little put out when the concert organisers got up to make an announcement before the recital that night (about toilets, the bar, parking…mundane things) and then said, “Please welcome Angela Hewitt” without saying one word about the fact that I would then be brought out in a wheelchair! A prime example of the famous British upper lip….? So I made somebody go out and tell them to say at least something–which the person then did, but only to say I had had an accident and that the audience needed to be patient, which I considered a gross understatement and not very gracious. Oh well…. Read an account from an audience member here! And the review from London’s Independent newspaper here. And a report from CBC news here. « Another year is almost up!